The needs of the customers drive the project. The team creates a high-level plan for delivering the project. The team develops the product over several iterations and refines the high-level plan over time. The team has effective tools for adapting to changes that occur. By using Visual Studio Application Lifecycle Management (ALM), you can manage customer needs more effectively. You can create a high-level plan that breaks your project down into potentially shippable increments, and you can create detailed plans to execute shorter iterations in which you develop those increments. Because you develop detailed plans at the start of each iteration, you have more certainty in how the plan progresses with each milestone that you reach. When your team finishes each iteration, you can refine the high-level plan based on what you might have learned during the iteration. You can also replan any work that was not completed. 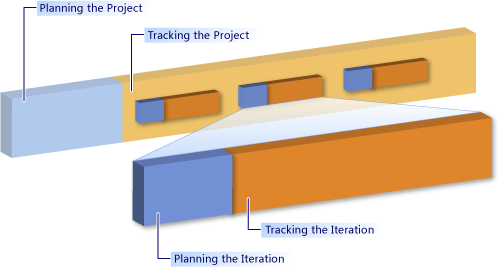 Your team can use Visual Studio ALM and apply an appropriate process template to plan, develop, and track your project iteratively. If you are starting a project and must decide which process template to use, see Choose a Process Template. If you use a process template that is not listed, you might find associated guidance on another site. Learn about the new features and capabilities available to plan and track projects. You can create, view, and manage dependencies among work items and collaborate across groups and team projects much more effectively with the current release of Visual Studio ALM. Understand what features are available based on the client and server versions that you use. With the addition of features in Visual Studio Team Foundation Server 2010, you will want to know the limitations or restrictions that occur in earlier versions of Team Explorer that connect to Team Foundation Server 2010. You can work around most limitations by installing the current release of Team Explorer in a side-by-side configuration with an earlier version of Team Explorer or by using Team Web Access. Update an upgraded team project to access several new features that are available with the upgrade to Team Foundation Server 2010. Also, you can view pre-upgrade reports and determine how to update custom reports based on earlier schema versions of the data warehouse. Create a team project to track information and to organize source code, builds, tests, and plans for your team. After you create a team project, you can manage and track work through the resources that were provisioned for your team project. Interact with Visual Studio ALM and Team Foundation Server through one of several client applications. All clients require that you connect to a server that runs Team Foundation Server and select a project collection and a team project. All clients require that you have the required permissions to access the team projects that you select. Use work items to track and manage your work and information about your team project. A work item is a database record that Team Foundation uses to track the assignment and progress of work. You can use different types of work items to track different types of work, such as user stories, customer requirements, product bugs, and development tasks. Plan projects, schedule tasks, assign resources, and track changes by using Microsoft Project. By using Microsoft Project, you have access to features that Team Foundation Server does not have, such as a project calendar, Gantt charts, and resource views. Create and customize reports to track your team's progress. You can create reports that highlight the data that is most important for your project. By creating your own reports, you can drill down on specific information that is not analyzed by the default reports. In addition, you can customize how your reports are run, displayed, and delivered to each member of your team. Customize your team project to support specific processes and practices that your team uses. Before you start any customization activity, you should become familiar with the types of objects and methods that you can customize and how you can use each object to support your project tracking requirements.